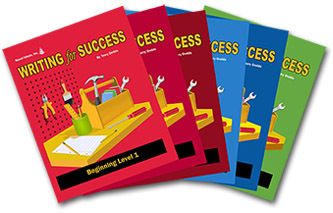 Writing for Success is a six-level explicit direct instruction writing program that provides teaching strategies and instructional materials to help students develop the skills they need to become successful writers. Writing for Success is designed to be used with an entire class or with small groups of students and allows you to provide differentiation within your classroom. It is non-age specific to be used with students of any age including adult learners who are writing at a specific skill level. Additionally, all writing assignments in this program can be done on a word processor or in handwritten format. Writing for Success is distinctive in that it offers a three-step instructional model based on best practices educational research, supporting the belief that all students can become effective writers. (Model) In the first step, students hear or read exemplars in the form or genre of writing they are learning about. You and your students then work together to analyze an exemplar. This approach helps students develop the metacognition skills they can generalize to their own writing. (Guided/Collaborative Practice) IIn the second step, you and your students work collaboratively to plan and draft a passage, revise it, and complete the writing cycle by proofreading. (Independent Practice) The third step engages students in planning, drafting, editing, proofreading, and publishing an individual piece of writing. You then guide them through a revision process geared to the specific genre in which they’re writing. Research has found that students in grades two through eight produced better stories when they participated in this type of teacher-directed revision. Each level of Writing for Success also gives you a choice of units: Descriptive Writing, Narrative Writing, Expository Writing, Persuasive Writing, and Letter Writing. Each unit, comprised of at least eight lessons, focuses on the writing process, giving students specific instruction and repeated practice to develop the skills they need to be effective with written expression. A lesson is a cycle of activities that may require one or more class periods to complete. Each unit of Writing for Success contains an element scoring rubric designed to reflect the Six Traits of effective writing. These scoring rubrics allow you to be fair, consistent, and effective in evaluating your students’ writing at each level. In addition, when students use an element rubric as part of the revision process, they will be better able to see what makes an effective piece of writing. Writing for Success can be used as a stand-alone writing program or to complement other language/writing programs. If the program is taught with fidelity, students will master the writing skills mandated by the Common Core State Standards as well as specific state standards.